Complete Asbestos Guide - Are Microscopic Needles That Kill Inside Your Home? What is Asbestos? Are Fibers Lurking in Your Home? What Abatement and Removal Advice is Best for Homeowners? 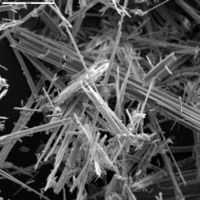 Below is an image of Anthophyllite Asbestos fibers which illustrates the fine needle-like structure of the potentially deadly particles. These tiny fibers often can only be seen and identified using special Asbestos microscopes and a highly trained eye. Asbestos fibers are like durable mineral needles, and if inhaled, they can travel deeply into your lungs where they pierce and severely irritate tissues within the Respiratory System. Tissue damage and scarring following Asbestos exposure may eventually result in deadly diseases such as Mesothelioma, Asbestosis, or Lung Cancer. This page will help protect you and your family from possible indoor Asbestos hazards. Here I will help you understand more about Asbestos Fibers: what it is, its health effects, where it might be in your home, and what to do about it if it is. Asbestos is a mineral fiber. It can be positively identified only with a special type of microscope. There are several types of asbestos fibers. Asbestos is a generic name given to six fibrous minerals that have been used in commercial products. The six types of asbestos are chrysotile, crocidolite, amosite, anthophyllite asbestos, tremolite asbestos, and actinolite asbestos. Several properties that make asbestos so versatile and cost effective are high tensile strength, chemical and thermal stability, high flexibility, low electrical conductivity, and large surface area. The leading domestic markets are roofing products, gaskets, and friction products. Nearly all of the asbestos produced worldwide is chrysotile. In the past, asbestos was added to a variety of products to strengthen them and to provide heat insulation and fire resistance. Even if asbestos is in your home, this isusually NOT a serious problem. The mere presence of asbestos in a home or abuilding is not hazardous. The danger is that asbestos materials may becomedamaged over time. Damaged asbestos may release asbestos fibers and become a very serious health hazard. Disturbing it may create a health hazardwhere none existed before. Please read this entire page before you have any asbestosmaterial inspected, removed, or repaired. Vermiculite Insulation mined in Libby Montana prior to 1990 and branded as Zonolite Attic Insulation may contain significant amounts of Asbestos. One of the most important facts about the hazards of Asbestos is that almost all of the cases of Asbestos-related Lung Cancer occurred among people who smoked cigarettes AND were exposed to Asbestos. Because of some interaction in the body, people who are exposed to Asbestos and also cigarette smoke have an increased risk of Lung Cancer 50 to 90 times greater than people who do not smoke cigarettes and are not exposed to Asbestos. This link between increased risk of Lung Cancer from Asbestos exposure and cigarette smoke exposure is just one more good reason never to smoke. If in doubt, treat the material as if it contains asbestos or have it sampled and analyzed by a qualified professional. A professional should take samples for analysis, since a professional knows what to look for, and because there may be an increased health risk if fibers are released. In fact, if done incorrectly, sampling can be more hazardous than leaving the material alone. Taking samples yourself is not recommended. If you nevertheless choose to take the samples yourself, take care not to release asbestos fibers into the air or onto yourself. Material that is in good condition and will not be disturbed (by remodeling, for example) should be left alone. Only material that is damaged or will be disturbed should be sampled. Send the sample to an EPA-approved laboratory for analysis. The National Institute for Standards and Technology (NIST) has a list of these laboratories. You can get this list from the Laboratory Accreditation Administration, NIST, Gaithersburg, MD 20899 (telephone 301-975-4016). Your state or local health department may also be able to help. Covering(enclosure) involves placing something over or around the material that contains asbestos to prevent release of fibers. Exposed insulated piping may be covered with a protective wrap or jacket. Asbestos Professionals: Who AreThey And What Can They Do? To find out whether your state has a training and certification program for asbestos removal contractors, and for information on EPA's asbestos programs, call the EPA at 202-554-1404. Wear a respirator approved for use with asbestos. Do not dry sweep; use wet procedures for clean-up. Dispose ofany residue or unused material along with the clean-up materialsin a manner that will not release airborne fibers. To getinformation on how to dispose of asbestos, call the EnvironmentalProtection Agency (800-368-5888) and ask for your regionalasbestos coordinator. Do not use power operated or other tools to cut or drillbecause this can create respirable dust levels. Keep these products out of the reach of children. The extent of current asbestos product labeling is limited.Except for products which are sold unwrapped, such as millboard;and asbestos-cement sheet, all products are labeled with the nameof the manufacturer or distributor. Only asbestos paperand furnace cement are labeled as containing asbestos.Non-asbestos substitutes for all asbestos products are widelyavailable to the public for household uses. CPSC requires that the labeling requirements of the FederalHazardous Substances Act apply to asbestos products. Asbestosproducts not labeled according to these provisions will beconsidered misbranded, and thus will be subject to enforcementaction by the Commission. The aim of this page is to respond to some frequently asked questions about asbestos and to provide information to help the homeowner make informed decisions about its care and maintenance. Asbestos is the name for a group of naturally occurring minerals that separate into strong, very fine fibers. The fibers are heat-resistant and extremely durable, and, because of these qualities, asbestos has become very useful in construction and industry. In the home it may or may not pose a health hazard to the occupants, depending on its condition. When it can be crushed by hand pressure or the surface is not sealed, to prevent small pieces from escaping, the material is considered FRIABLE. In this condition fibers can be released and pose a health risk. However, as long as the surface is stable and well-sealed against the release of its fibers and not damaged, the material is considered safe until damaged in some way. Asbestos tends to break down into a dust of microscopic size fibers. Because of their size and shape, these tiny fibers remain suspended in the air for long periods of time and can easily penetrate body tissues after being inhaled or ingested. Because of their durability, these fibers can remain in the body for many years and thereby become the cause of asbestos related diseases. Symptoms of these diseases generally do not appear for 10 to 30 years after the exposure. Therefore, long before its effects are detectable, asbestos related injury to the body may have already occurred. There is no safe level of exposure known, therefore exposure to friable asbestos should be avoided. Descriptions given in this booklet may help in identifying asbestos-containing materials. People who frequently work with this material, such as plumbers, contractors, and heating specialists, can often correctly guess whether a material contains asbestos. However, the only way to be sure is to have a sample of the suspect material analyzed by a laboratory. Do not rely on visual determinations. It is prudent to treat material which could contain asbestos as if it does, until and unless reliable analysis proves otherwise. Laboratories that do this work are usually listed in the telephone yellow pages as "LABORATORIES-ANALYTICAL". Remember, the asbestos fibers that would cause health problems are much too small to be seen without a powerful microscope. In fact, an average human hair is approximately 1200 times thicker than an asbestos fiber. It is important that you not release asbestos fibers into the air or onto yourself when taking samples. Only you should be in the room when sampling is accomplished. A light wetting of the material using a fine water mist prior to taking the sample will reduce the release of asbestos fibers. Do not disturb the material any more than is required to take a small sample. Penetrate the depth of the dampened material with a clean sample container (35mm film canister or small glass or plastic vial). After the sample is in the container - tightly seal it. Use a damp paper towel to clean up any material on the outside of the container or spilled onto the floor. Label the container - the label should contain an identification number and clearly indicate when and where the sample was taken. Send the sample to a laboratory for analysis. Laboratory analysis can be expensive, ranging from $20 to $40 per sample. A sample should be taken for each different appearing suspect material. For a ceiling surface in a large room, two samples may be required to give an accurate determination of asbestos content. IF YOU FIND ASBESTOS IN YOUR HOME, WHAT SHOULD YOU DO? As noted under the section headed "WHERE ASBESTOS MIGHT BE FOUND IN YOUR HOME" and subsequent pages of this booklet, asbestos may be present in many products and materials about the home. This normally presents no problem as long as the asbestos is in good condition and is not disturbed or misused. When it becomes necessary to repair an item containing asbestos, when it is necessary to remove asbestos-containing material such as ceiling finish or pipe insulation, or when something has damaged asbestos-containing material such as pipe and boiler insulation, a professional in the asbestos field should be called. The professional should have special training, such as that required by many states for asbestos worker certification. He/she should have special equipment, such as vacuum machines with very fine filters. These filters are known as "HEPA" filters, which stands for HIGH EFFICIENCY PARTICULATE AIR and are designed to filter out the asbestos fibers. (Household and shop vacuum cleaners, for example, which are not specifically designed for asbestos will only scatter the fibers throughout the house, making the situation worse). Such training and equipment are expensive and not usually practical for homeowners. In spite of the fact that it is unwise to do so, the homeowner in most localities is not prohibited by law from repairing or even removing the asbestos-containing material in his/her home. There are times when, due to accident, lack of information, or other reasons, a homeowner attempts to deal personally with an asbestos problem. Therefore, the next few pages of the booklet are dedicated to giving the homeowner as much information as possible to help him/her minimize the risk of asbestos exposure in the home. Pipe, furnace, and boiler insulation: when the insulation material will move at the touch of the hand or the cover no longer feels firm and tight, the insulation is probably too deteriorated for repair. For material in this condition, call a professional. Repair by the homeowner should only be attempted, if at all, where the insulation is firm and the cover tight, and there should be a minimum of holes or tears in the insulation (for example, no more than a one inch diameter opening in four lineal feet of pipe covering). For minor damaged areas such as this, you can obtain commercial products designed to fill holes and seal damaged areas in asbestos pipe insulation. These products area available from safety stores1 Suppliers listed in the yellow pages of the telephone directory under the heading "Safety Equipment and Clothing" are referred to in this booklet as "safety stores. ", which specialize in asbestos repair materials and safety items. Sprayed-on asbestos-containing material on walls and ceilings should not be disturbed in any way by the homeowner. If the material has never been painted, a coat of penetrating or bridging encapsulant2 Encapsulants are materials normally applied in liquid form to provide a seal against the release of asbestos fibers. Bridging encapsulants such as paint and similar materials form a "skin" on the surface to contain the fibers. Penetrating encapsulants are thin liquids which soak in and set hard like a plastic, making a homogenous non-friable mass. can be sprayed on with an airless sprayer to seal the surface to ensure no fibers are released (don't use a brush or roller). Penetrating encapsulants soak into the material and firmly adhere it to the wall or ceiling. However, it makes any future removal more difficult. Bridging encapsulants are applied like paint and the resultant skin seals the surface and does nothing to make the sprayed on asbestos adhere better to the wall or ceiling. A light coat of latex base paint may be used as a bridging encapsulant and may be used even if the material has previously had an encapsulant applied to it. Keep in mind that you should not build up such a thick coat that the added weight will increase the chance that the treated material may fall off the wall or ceiling. Removal should not be attempted by the homeowner, but left to professionals. This action requires special equipment and detailed training which would generally be too expensive and time-consuming for a homeowner to acquire for a one-time job. Removal is also the last choice among alternatives because it poses the most risk of fiber release if not done properly. A glove bag is a heavy plastic bag measuring approximately four feet wide by five feet deep, with an open top and two plastic sleeves with gloves attached to one side. In use, the top is taped around the pipe and a HEPA vacuum used to assure asbestos fibers do not leak out. The worker inserts his/her arms into the sleeves and is thus able to make repairs to the insulation while that area of the pipe is completely sealed within the bag. After repair is complete, (the air in the bag is exhausted with a HEPA vacuum as it is unsealed from the pipe) the bag is carefully sealed with tape as it is removed from the pipe. This prevents leakage of the air, which contains asbestos fibers, into the room. The professional asbestos contractor will build an enclosure of two layers of plastic on the floor and the walls and three leaf doors of 6-mil plastic for access. Some negative pressure air machines will be used to control air flow and insure against fibers traveling throughout the home. The professional asbestos contractor will have a HEPA vacuum, a negative pressure air machine, approved respirators, disposable clothing, and a supply of glove bags and miscellaneous tools for the asbestos removal and the cleaning of the room. Provision also will be made for taking air samples to insure that the area is clean after completion of the work. In choosing a professional to do work with asbestos, keep in mind that most home repair or remodeling contractors do not have certification or certified workers nor are they equipped to work with asbestos safely. If you hire someone who is not qualified, not only have you potentially subjected yourself and your family to serious health dangers, but also there can be legal problems because of local, state, or federal laws regarding environmental protection and workers' health. If the contractors do not have the right equipment and expertise and do the work improperly, they will spread asbestos fibers throughout your home and the neighborhood. They may create an asbestos hazard where none existed or make an existing friable situation worse. You should require references from the contractor's former customers before you make an agreement for removal. In addition, find out from the Better Business Bureau or a local environmental or worker safety agency if they have received complaints about or found violations of regulations by the prospective firm. In some areas, an asbestos contractors' association provides a referral service, which may also be useful to you. Remember, as the owner of the property, you are responsible for the safe disposal at an approved landfill, even if you have hired someone to do the work for you. IF YOU THINK ASBESTOS HAS BEEN RELEASED IN YOUR HOME, WHAT SHOULD YOU DO? If the release appears significant (for example, 4 or 5 square feet of sprayed-on ceiling material or 1 to 2 feet of pipe insulation), close off the portion of the house, such as a bedroom or the basement, in which the problem has occurred, so that people will not be exposed. Close off air ducts and vents, shut windows, and tape bottoms of doors to prevent drafts. Contact someone who is trained in asbestos problems, such as a local health authority or a qualified contractor. You will probably want to have samples of dust or debris from floors, shelves, or window sills taken and analyzed by a laboratory. Air samples may also be needed to define the situation; if so, they must be taken and analyzed by a laboratory or a contractor who has the proper training and equipment, but the samples must be analyzed by a laboratory. Ask for prices for this work before selecting a laboratory to do it. Analysis of material (bulk samples) and air samples will provide the information needed to decide what further measures may be required. Depending upon the amount of asbestos-containing material present, you may be required to notify authorities in your area before you remodel, dismantle, or demolish your home or part of it. They will want to know what work is intended and your proposed method of asbestos removal and disposal. The law also requires that "no visible emissions" of dust are allowed during removal, transportation, and disposal of asbestos-containing materials. Further and more detailed information concerning this aspect of homeowner responsibility is available in the EPA "Purple Book". See Page 11 of this booklet for information on obtaining this and other publications regarding asbestos. All asbestos waste and the disposable clothing, filters, equipment, and building materials which are not to be cleaned and reused must be disposed of as asbestos waste. The material must be in double 6-mil plastic bags, labelled as asbestos, hauled to an approved asbestos landfill in a covered vehicle, and disposed of according to EPA, state, and local regulations. The contractor or homeowner should contact the health department or air pollution control agency in the area where the asbestos removal is to take place to determine local notification, removal, and disposal requirements and sites. Place all dampened filters, cloths, mopheads and other asbestos wastes into a transparent (6-mil) plastic bag. Seal the bag with heavy duty tape. Place the first bag into a second bag. If the bags are not already preprinted, label the bags with a sign: "DANGER; CONTAINS ASBESTOS FIBERS, AVOID CREATING DUST, CANCER AND LUNG DISEASE HAZARD". The sign should be placed between the two transparent plastic bags. Seal the second bag with heavy duty tape. Place the sealed and labeled bags with other solid waste material for pick-up and delivery to an approved waste disposal site. Asbestos waste materials should be disposed of according to Federal and local regulations. Exterior walls and closed decks were sometimes built with a fire retardant sheeting in the form of asbestos paper. If it looks like a thick gray cardboard, it may contain asbestos. If left undisturbed and in good condition, the undersheeting is considered safe. However, if you are taking out a wall for expansion and remodeling, or if you are replacing siding and shingles, you could release many fibers in the process of drilling, sawing, and removing. Hire professionals for removing this paper. Cement asbestos board (commonly referred to as CAB) has been used in houses as sheets for straight and lap siding and has been cut and shaped as a substitute for wood shingles for roofs and exterior walls. The material is hard and brittle, normally light gray in color, was pre-drilled for fastening, and often was factory primed and painted. Since this material is mainly outside the home, and the asbestos is bound in a hard material, it presents little hazard, unless altered by drilling, sawing, or sanding. When CAB becomes worn or damaged, spray paint it to ensure sealing in the fibers. If you must remove CAB be very careful to wet the material and cut or pull the nails so that damage or breakage of the CAB is minimized. Brake pads and linings, clutch facings and various gaskets often contain asbestos, particularly in older cars. When it is time to replace these parts, consider substituting non-asbestos materials which are available for some clutch facings, gaskets, and brake materials. As asbestos clutch facing, brake shoe, and brake pad materials wear down in normal automobile use, asbestos-containing dust in the form of tiny fibers is created and released to the outside environment. Much of this material is entrapped within the clutch space or brake housing, ready to be released in concentrated form when repair and replacement work is done. This concentration of fibers is especially dangerous for the home mechanic who does such work without proper safety equipment and awareness. This situation is made worse if the work is done within an enclosed space, such as a garage. The house and surrounding environment can be further contaminated by using compressed air, or vacuuming the brake residue with a shop or home vacuum cleaner. Do not use compressed air or vacuums. Ideally, work on clutches and brakes should only be done by professionals where specialized vacuum and protective equipment is available and where the mechanic is properly trained. Refer to the EPA literature listed at the back of this brochure for further information about this work. Loose blown-in and batt insulation infrequently have been known to contain asbestos, especially in homes built or remodeled between 1930 and 1950. This material was used for thermal insulation and can be found where interior rooms and spaces need to be protected from outside temperatures. These areas include outside walls and floor or roof/attic spaces between structural joists and rafters. This asbestos presents a hazard only if renovation and repair work disturbs it. If you plan such a project and find asbestos-containing materials, be sure certified and/or qualified contractors/workers are consulted and hired so you do not spread asbestos fibers throughout your home and the environment. "In an approved manner" refers to legal procedures for asbestos disposal applicable to the jurisdiction in which the house is located. Contact local health or air pollution control authorities to determine requirements for proper disposal of asbestos containing material and products.. Be sure not to power grind or sand down the flooring, the remaining adhesive or adhesive backing. If you need to replace floor covering, sometimes the best solution is to lay the new floor directly over the old one. However, you should keep in mind that this asbestos-containing material remains in your house, and must eventually be dealt with if and when you remodel or demolish. Notifying future buyers of its hidden existence may be required in your locality. Insulation blankets (the outside covering or shell), door gaskets, duct insulation, and tape at duct connections of furnaces and boilers all may contain asbestos. It was used as the best material available, during its time, as high-temperature insulation. Oil, coal, or wood furnaces with asbestos-containing insulation and cement are generally found in older homes, its installation dating between 1930 and 1972. The material is white or grey in color and resembles the plaster used in casts to protect broken bones. If your furnace insulation is in good condition, it is best to leave it alone and keep maintaining it in good condition. If the insulation is in poor condition (friable), or pieces are breaking off or it has been subject to water damage, you should have it repaired or removed entirely. You may want to have the entire furnace replaced by a more modern efficient model. You should first find out if the insulation actually contains asbestos by sampling and analysis. While the insulation is in poor condition and awaiting repair or removal, children should be prevented from playing in or near the space to protect them and prevent further insulation damage. Steam and hot water pipes were insulated with asbestos-containing material, particularly at elbows, tees, and valves. Its appearance is similar to that found on boilers. Pipes may also be wrapped in an asbestos "blanket", or asbestos paper (which looks very much like corrugated cardboard). Asbestos-containing insulation has also been used on and inside round and rectangular furnace ducts. Sometimes the duct itself may be made of asbestos-containing materials. If you have moderately damaged insulation around pipes or boilers, the best current recommendation is to leave the insulation in place and have the protective covering repaired. Asbestos-containing cement sheets (CAB), millboard, and paper have been used frequently as thermal insulation to protect the floor and walls around wood burning stoves. Again, there is no hazard if left as is, if it is in good condition. Sprayed-on or trowelled-on surface material on wall and ceiling surfaces of some homes may be composed of asbestos-containing materials. If the surface material is firmly attached, has a hard surface, and has no water damage, it should not be hazardous. If the surface can produce powder or dust by hand pressure, it is advisable to seek professional advice before deciding what further course of action to take. You may choose to send a sample to a lab for analysis; and for this option you should follow sampling guidance described earlier in this booklet. You should not try to do either repair or removal of this material yourself. There's too much danger you will expose yourself and your family to heavy concentrations of asbestos fibers. Contact a contractor whose workers are specifically trained to remove this type of material without contaminating people or the environment. Materials in older lamp socket collars, electric switch and receptacle boxes, liners for recessed lighting, backing for switchboard panels, fuse boxes, and old-fashioned "knob & tube" wiring have all, at times, been found to contain asbestos. Normal use of these items should not pose a hazard. Replacement products in these categories do not contain asbestos. Dispose of these items, when they are replaced, in an approved manner. Oven & dishwasher (in cabinet) units were often wrapped in asbestos-containing insulation blankets or sheets until the mid-1970s. Homeowners should not disturb these materials since they do not pose a hazard if left in place. Removal or repair should be done by professionals, and the materials or the entire unit should be discarded in an approved manner. Portable dishwashers, toasters, clothes driers, popcorn poppers, broilers, electric blankets, slow cookers, and similar small appliances all have had parts made with asbestos-containing materials, which could give off fibers when the appliance is being disassembled for repair. The use of asbestos in these appliances is declining and newer items may have none. Consider discarding these items in an approved manner instead of repairing them. Some older hair driers and portable heaters, where the coil-wrapping and insulation contain asbestos, may still be in use. These driers and heaters should be discarded. Manufacturers voluntarily recalled hair driers containing asbestos in 1979, since laboratory tests of these hair driers showed that asbestos fibers were being released during their use. Some older models of freezers and water heaters may have asbestos in the insulating blanket within the metal cover. These should not pose a hazard in normal use. Discard in an approved manner. In general, when asbestos is used in appliances, it is in parts which will probably not result in the release of asbestos fibers during use, with the exception of hair driers and portable heaters where air currents pass over the material. It is unlikely that other asbestos components in these appliances present a significant health risk, unless dismantled. Older gas-fired decorative fireplace logs and artificial ashes may have a considerable amount of asbestos fibers and, if disposed of, should be handled in the same manner as other asbestos materials. Asbestos-containing gloves, stove-top trivets, and pads that are still being used should also be discarded. Asbestos is only dangerous when it's deteriorated to the point where its tiny fibers can be released into the air and inhaled. If the material is solid (in appearance and to touch) and maintained in good condition, it presents no problem. If the asbestos-containing material in your home has become deteriorated for some reason, there's a good chance you can solve the problem without removal. Removal is generally the last resort, because it involves disturbing the material and sending more fibers into the air. 1.2 What happens to asbestos when it enters the environment? 1.3 How might I be exposed to asbestos? 1.4 How can asbestos enter and leave my body? 1.5 How can asbestos affect my health? 1.6 How can asbestos affect children? 1.7 How can families reduce the risk of exposure to asbestos? 1.8 Is there a medical test to determine whether I have been exposed to asbestos? 1.11 Complete Asbestos MSDS Information - EVERYTHING you could ever want to know about Asbestos past, present, or future! There is also a section on Asbestos in our extensive Household Chemical Guide - where you will find information on over 100 other household chemical and product hazards. This is one of the largest guides to household chemical and product hazards on the internet today! Tons more info. being added regularly. Learn why your lungs are so succeptable to damage by asbestos.